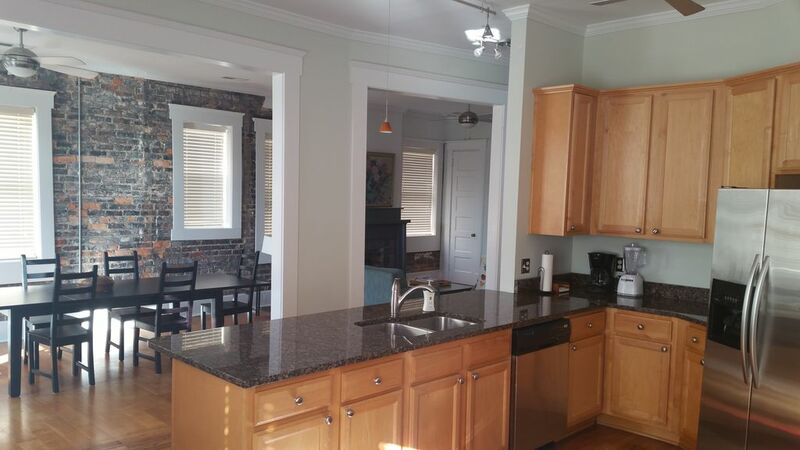 Spacious, historic urban condo located in downtown Wilmington. It is a nonsmoking condo. Also, no pets are allowed. The Condo: You'll love this second story, two bedroom, two-bath condo with its open airy space (1500 sq ft). The unit contains 10 foot ceilings, hardwood floors, exposed brick walls, granite counter-tops, stainless steel appliances and skylights. The master bedroom has a queen bed. The second bedroom has two twin beds, and there is a queen sleeper sofa in the den. The unit sleeps 5-6. You can end the evening sipping a glass of wine or cup of coffee from the large deck at the rear of the condo with a view of the downtown. Located in the Federal National Historic Registry, the Strauss Building was built in 1914 and was the original “mixed use” development. The ground floor contained retail establishments for most of its life – including A&P Grocery and Sears – while the second story has always been residential. In recent years, the building has been the used occasionally for television and movies – including “The Crow”,”Young Indiana Jones”, “One Tree Hill” and a recent appearance in NBC’s new television series “Revolution.” The building is known locally for its refrigerator door, which provides entrance to the condo from 4th Street. Note: this is a second story unit without an elevator; the unit is not handicapped accessible; you must be able to climb stairs to access the unit. Enjoy the activity and excitement of historic downtown Wilmington with a quiet night’s sleep in the historic Strauss Building located 3 blocks from the waterfront. The location (703 N 4th Street) is convenient to everything downtown Wilmington has to offer: Thalian Hall, The Brooklyn Arts Center, casual to fine dining, hip coffee houses, art galleries, excellent county library, horse drawn carriage rides, Shops of Old Wilmington or the Cotton Exchange, historic tours, Screen Gems Studio tours, Ghosts of Wilmington Tour, haunted pub crawls, Wilmington’s Farmer’s Market (April – December), the Azalea Festival (April), Riverfest (October) and the NC Battleship. PPD, Cape Fear Community College and the new convention center are within easy walking distance. You can experience the night life, then walk a couple of blocks back to the condo and spend a safe and quiet evening in your beautifully furnished unit. If you have a car, there is an abundance of free on-street parking or there is free parking provided in a private lot behind the building. No need to pay for parking. If this property is not available or you need something bigger, check out our other property located across the street www.vrbo.com/702663. Around Town: The Brooklyn Arts Center, where a variety of concerts and performances take place year round, is just across the street. Modern dancers, chamber orchestras, concert pianists, singers, comedians, theater companies, jazz ensembles, and many other concerts are featured at the Brooklyn Arts Center. The Brooklyn Arts Center at St. Andrews is the most stunning and spectacular small-market concert venue in the Southeast.” After a show stop by the Goat and Compass Tavern for a nightcap. Located one-half mile south of the condo is Thalian Hall. The 1858 Thalian Hall is one of the most significant theatres in the United States and has been in almost continuous use since it first opened. The theatre has been under the management of the Thalian Hall Center for the Performing Arts, Inc. since 1963. Last year there were over 250 shows, events and films for a total of 495 performances, and these programs attracted audiences totaling more than 85,000 people. The events ranged from music to ballet and theatre, from pop, jazz, folk and country music to the finest in domestic, independent and foreign films. A five minute drive across the Cape Fear River is the USS NORTH CAROLINA. Moored in quiet dignity and majesty the Battleship NORTH CAROLINA, across the river from downtown Wilmington, beckons visitors to walk her decks. Envision the daily life and fierce combat her crew faced in the Pacific Theatre during World War II.Step back in time and let history come alive through the crews’ stories. Discover and build your personal connection by steering the ship, starting her engines or even firing the guns. Area beaches are a short drive away: Wrightsville Beach (15 minutes), Carolina Beach (30 minutes), or Kure Beach (45 minutes). This unit is owned by four local Wilmington families. Collectively, we restored this unit and work together to maintain and lease it as a vacation rental. We collectively participate in the lease of this unit so as to provide superior service to our tenants. We were intrigued by the history of the property and by recent economic development in the area surrounding the property. This property can be found in the Federal National Historic Registry. Although the unit was completely renovated and updated in 2008, there are architectural features that can't be found in other condos or apartments. One block from the Brooklyn Art Center and the Wilson Center. Within easy walking distance of riverwalk, convention center and most downtown attractions. Free parking is provided in the rear. Living area includes a queen sleeper sofa. There is a dining area that seats 6; there is also a breakfast nook that seats 2. Some boards games are in the unit. DVDs of television series and films with ties to Wilmington are available including 'Dawsons Creek', 'One Tree Hill' 'Matlock', 'The Crow', 'King Kong Lives', 'Lemony Snickett' and others. large deck in the rear overlooking downtown Wilmington. Cute apartment. Downtown a short walk away. The apartment was comfortable and clean. For our Thanksgiving stay Tony even left a roasting pan out for us. Four minute walk to the Cotton Exchange for shops, meals and excellent coffee. This is my fourth time to stay at Tony and Neal's and I have never been disappointed. The place is clean and the location could not be better. Walking distance to downtown but not on the main, noisy drag. And there's parking on site!! Love it! This condo far exceeded my group’s expectations, which were already pretty high based solely on the pictures provided and location. The condo is spacious and homey, as well as centrally located in the heart of downtown Wilmington within walking distance of several great restaurants and coffee shops. Our host communicated things clearly and provided easy to follow instructions for check in and check out procedures. My friends and I used the condo for a bachelorette weekend, and I highly recommend it to any group or family looking for a place to stay that has both character and class and is surrounded by great culture. The house was really gorgeous. Pictures do Not do it justice! We just went for my bachelorette weekend. And we couldn’t be happier! It is perfectly located. It’s close enough to where we could just walk downtown. I would highly recommend this place!! The only downfall, is the abundance of stairs, they were not the easiest thing after a night out of partying. Other than that, it was wonderful. Thanks Adam not only for renting from us but also for taking the time to submit a review. We really appreciate it! My family and I recently stayed at this place and loved it!! Place was great, we really enjoyed the area (Brooklyn Arts district). The owners were very easy to work with and we hope to come back next year! Thank you Mike! Not only for renting from us but also for taking the time to write a review. We really appreciate it! Contract is required; upon verbal commitment to rent a contract is emailed. Contract must be completed, signed and either emailed or faxed. Upon receipt of completed contract, we sign the contract and email an executed copy to tenant.